Through Arthur Holdsworth we can trace the career of an 18th-century fishing admiral. Holdsworth held no known courts or meetings during his tenure as admiral. Archival evidence does not support the stereotype of the admirals ruling with the whip. Prowse had never witnessed any such scene, nor had he ever met a fishing admiral. He was repeating an account written two generations earlier by Patrick Morris, a political reformer who also had never observed a fishing admiral's court. Morris was himself relying on an earlier history written by Lewis Amadeus Anspach. Both Morris and Anspach, in turn, had been heavily influenced by John Reeves' seminal History of the Government of the Island of Newfoundland, published in 1793, which repeated second-hand accounts of alleged corruption. The problem, of course, is that each of these writers had his own agenda, leaving historians with no reliable secondary source. We know exceptionally little about how the fishing admirals actually conducted themselves, and even less about the role others might have played in maintaining law and order: who were the admirals and what did they do? The most accurate answer is that they were no different from the island's fishing masters, from whose ranks they were drawn. Masters in this sense denoted captains of fishing ships that made the annual voyage from England to Newfoundland: some were wealthy landowners, but most were lesser merchants with few pretensions to gentility. While the vast majority of these men remain anonymous in official records, there were exceptional families, such as the Holdsworths of Dartmouth, which produced a succession of prominent admirals. 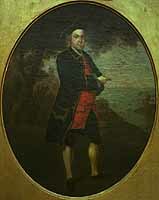 Holdsworth was fishing admiral of St. John's harbour in 1700. The son of a vicar, he was born in Dartmouth, England in 1668. He was one of five sons, most of whom were prominent in the Newfoundland fishery. Holdsworth died in 1726 while mayor of Dartmouth. Courtesy of Gordon Handcock, St. John's, Newfoundland. Original in the possession of Cmdr. Holdsworth, Holbeam Mill, East Ogwell, Devon. Through the case of Arthur Holdsworth we can trace the career of an 18th-century fishing admiral. At the age of 32 he assumed a prominent role in the family business, sailing to Newfoundland with his brother in their ship the Nicholas. By 1701 he had become admiral of St. John's harbour, a position he held off and on for the next ten years. He soon asserted himself in local society, creating a minor controversy when he dueled with an army officer over a perceived slight. The officer was later accused of cowardice but the Holdsworths did not suffer from the potential scandal. As the nearest thing to gentry on the island, the family had little to fear from anyone other than the commodore. Highly unpopular among their competitors, the clan expanded their operations into carrying passengers to Newfoundland, thus creating temporary labour gluts. Holdsworth also became heavily involved in the petty politics that marked early St. John's. He petitioned against competitors, curried favour with the garrison commander in return for contracts, and interpreted laws and customs as he saw fit. Whether for lack of interest or free time during the hectic fishing season, Holdsworth held no known courts or meetings during his tenure as admiral. After 1711 he stopped sailing to Newfoundland regularly and managed his firm from Dartmouth, where he built a large manor house. In short, he pursued his mercantile interests to the fullest: the legal responsibilities of his office appear to have been of little consequence. 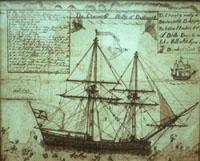 Although drawn by John Willcocks in 1754, the painting shows the Charming Molly, one of Arthur Holdsworth's ships, stuck in ice off Newfoundland in 1704.
with more info (22 kb). Though Holdsworth was certainly not a typical admiral in many respects, his career reflected a number of broader patterns. The fishing admirals lived in Newfoundland only during the summer months, when they were fixated on ensuring that their fishing operations succeeded. They were particularly pressed for time during the late summer and early autumn–from August to October they had to make all the necessary arrangements for settling contracts, prices, and shipping the codfish to market–but this was precisely when their services as law officers were most needed. Even when they had the opportunity, admirals were required, in essence, to police their competitors, a situation fraught with potential problems. Perhaps most importantly, there was no superintending authority other than the commodore, whose power extended only to acting as an appellate judge. In theory, complainants had to approach the admirals before bringing petitions before a naval officer. It is not surprising, then, that the admirals conducted little judicial business. The stereotype of the admirals ruling with the whip is simply not supported by the archival evidence. No admiral ever prosecuted or judged a criminal case, nor carried out or oversaw any punishment. Rather, the admirals' jurisdiction was in practice restricted almost entirely to property disputes. Of the ten extant orders sent to the admirals by the governor or his surrogate, five were to enforce fishery regulations, four applied to property law, and one related to the law of master and servant. All of the decrees, appeals, and proceedings of the fishing admirals court dealt exclusively with the law of real property, particularly the tracts of land along the waterfront known colloquially as ships' rooms or fishing rooms. Despite colourful local legends, the fishing admirals never became entrenched tyrants. During their visits to Newfoundland each summer, they simply had neither the time nor inclination to discharge the full responsibilities accorded to them by King William's Act.